I don’t usually write things like this, but this topic is rather heavy on my heart as I see all those happy-mom-dances on social media with the tail end of a school bus in the background. It is not my intention to offend anyone, but I fear this probably will. I’m so grateful we get to homeschool. My heart aches for you and for your children. I wonder if you realize just how much you’re really saying as you dance your way back down the street to your front door after seeing your kids off to their first day of school. But what are you really celebrating? I’m a home-schooler, so it’s hard for me to imagine, but I doubt you’re celebrating the fact that your child is embarking on a new year of learning. I don’t think you’re celebrating a new year of school lunches, long bus rides, or after-school activities. So what are you celebrating? I’m guessing that you’re happy to have your days back after being stuck with your kids all summer long. And that makes me so sad. I know it can be hard to keep the kids entertained all day, every day, but maybe next summer you could try keeping them engaged instead. There’s a huge difference between these two outlooks on your summer and you may just find that this seemingly small change can reap huge rewards for both you AND your children. Try keeping them ENGAGED instead of ENTERTAINED. I’m not trying to make you feel guilty. After all, this back-to-school mom-dance has become quite trendy on all the social networks. It’s so common that we hardly think about it any more. And that’s what I’m asking you to do. Please take a minute to think about exactly why you are dancing in the street. It looks like you’re happy that you just got rid of your kids for 7 hours a day, 5 days a week. If that IS the case, maybe you should think about WHY you’re so happy about that and see what you can do to fix your relationship with those precious little lives you’ve been put in charge of. And if that’s NOT the case, maybe you should re-consider performing this dance at all. I, for one, will be dancing with my kids in the front yard, waving to all the neighborhood kids who have to go to school. We’ll probably all still be in our pajamas and then, when that bus is out of sight, we’ll go in and make pancakes together and celebrate our first day of NOT going back to school this year. Not Back To School … Blog Hop Coming! I am one of the moms doing a happy dance. I am delighted to have an opportunity to share with you *why* I’m doing the happy dance, as I think there are some folks who might genuinely appreciate and take the time to consider another side. I homeschooled my older daughter from K4 – 11th grade. In 12th grade, she began studies at the Early College for Women at Mary Baldwin College. Homeschooling proved to be a viable experience for her. Homeschooling my younger daughter was never fun, or engaging, or delightful, or easy. She cried. Most of the time. I hung on . . . and on . . . . and on. I homeschooled her for at least two or three years longer than I should have (hindsight is an uncanny thing). Finally, we enrolled her in a local charter school, where I am privileged to serve as an active volunteer. I do a happy dance because I made the right choice for *my* child. She is thriving. She couldn’t *wait* to go back to school this year. I do a happy dance because my child is happy; therefore, I am happy. I do a little happy dance every day when she gets home from school, too. And I bet a lot of the moms who didn’t think they had to ask permission to be happy that their children were going to school — because for them, maybe school is a wonderful place full of learning, and passionate teachers, and happy memories being made — I bet they do a happy dance at the end of the day, the end of the week, right before Christmas break, and on the last day of school. There are a lot of things in this world to be sad about. Let’s give each other room to be happy. I especially hate the commercials that glorify this attitude. I will admit to being glad when my niece and nephew have school so we can do our thing at home. You should definitely NOT feel guilty for posting this. I, for one, am glad to see someone else stand up for their kids. I love my children. Yes, I have days that I just want to run away but those are few and far between plus it is usually MY fault! I have been blessed with the gift of motherhood and I can’t imagine waving good-bye to my sweet precious ones on the bus and DANCING happily away. Ridiculous. It shows selfishness and I can’t imagine what my child would think…I would be so hurt to see the person I love most in the world (mom and/or dad) waving and dancing as I was carted off to school. Sends a very wrong message in my opinion. But you know what??? That’s why I homeschool!!!! Thank the Lord!!! I can see both sides of the story. I love having my kids and homeschooling but every so often I’d love to stick them on a bus and have some quiet to think and clean. Thank you for sharing this, Sandra! I agree with you completely! Yes, mothering is hard work, but it is so worth it and I NEVER want my children to think that I want to get rid of them for any reason! 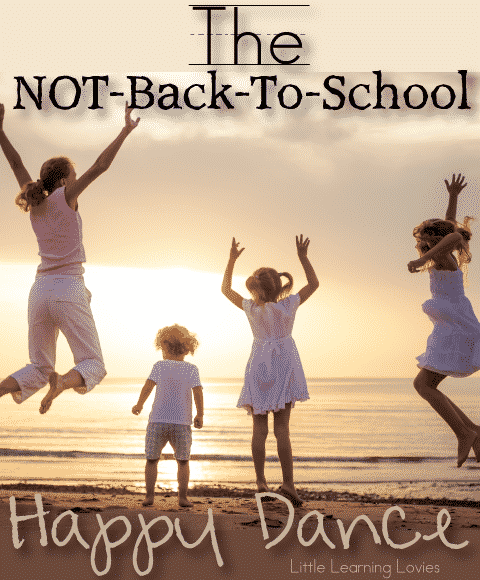 I despise those back-to-school happy dances too 🙁 We do a not-back-to-school happy dance in our home 🙂 I’m so thankful that I can keep my children at home with me where they can learn at their own rate, learn about the things that they are actually interested in and we can have fun while learning! Love this post! As a homeschooling mom I miss my kids when they are away at camps and other activities during the summer. I think many parents do not think about the message they are sending their kids. I think you’re right! It seems that the just aren’t thinking about their kids. Thanks for reading! I do a happy dance when all the kids go back to school so that we can go back to enjoying all of our outside-the-house activities undisturbed by those other rowdy kids. Louisville Zoo, here we come! Science Center, be there soon! Bowling party, you’re just around the corner! We haven’t forgotten you, either, Mini-Golf! I’m ALWAYS happy when public school starts up again for the same reason. No more crowds! lol But that’s a whole different reason to celebrate 😉 Mini-golf… I don’t even think we have one within a decent driving distance. I’ll have to check the Harrisonburg area. They have EVERYTHING down there. Lol. I, too, do not understand this social media phenomenon. I’m sure the “I’m glad you’re going to be gone” attitudes are conveyed to the children long before the “happy dances” take place. Don’t these moms understand that this doesn’t pass over the heads of their children? They get it. And it’s hurtful. They understand, “I drive Mom crazy and I’m not wanted.” So sad. I know! It makes me sad and mad all at the same time. Poor little darlings. Thanks so much for visiting and sharing your thoughts! Delightfully written and well said. I too, am a homeschooling mom and it is wonderful to spend time with my children and be in control of their subject content. I see time spent with our children as golden opportunities for growth and nurturing. In our house, we did the happy dance the moment school ended this year. I feel the summer is going way too fast. There is not enough hours in the day to do everything I want to do with my son. My mom was always sad to see us go to school and she would say that she didn’t understand why anyone would be happy to see their children leave. I feel the same way. Being with my son is the most rewarding thing I have ever done. Great article! Very nicely written! And I agree with you 100%. I just went back to work after staying home with the kids after 4 years and it breaks my heart to drop them off at school! I miss not having that time with them because they are only this young one. Engaging them is truly they way to watch them grow!